Situated in southern Utah are five national parks of spectacular beauty, each with unique geological formations, cliffs, rivers, and canyons of incredible colours. 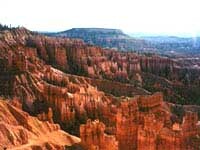 The most well-known parks are Bryce Canyon, with its weird orange 'hoodoo' pinnacle formations, and the magnificent canyons of Zion National Park. Canyonlands is the largest national park in Utah, a largely inaccessible landscape eroded into countless canyons and plateaus by the Colorado and Green Rivers that divide the park into three districts. The most accessible area of the park is the Island in the Sky District, which offers breath-taking views. The Needles Region features spires, arches, and red and white striped rock pinnacles that hold numerous opportunities for hikers. The rugged Maze District is the most remote section and is practically inaccessible. The more visitor-friendly red desert landscape of Arches National Park features thousands of natural sandstone arches and other fantastic rock formations such as pinnacles, balanced rocks, and spires that can be reached by short trails or roads, making the major sights easily accessible. Famous landmarks include Fiery Furnace, Balanced Rock, and the park's most famous feature, Delicate Arch. In the centre of Utah is the state's newest park, Capitol Reef. The most splendid geological feature here is the multi-layered orange, red and white cliff wall that formed a seemingly impassable rock barrier to early pioneers, stretching for hundreds of miles and known as the Waterpocket Fold. Lifted up by forces within the earth's crust, the peaks and pinnacles formed sandstone sections that reminded them of the white domes of capitol buildings. There are very few roads bisecting the southwestern region and it is difficult to access most of the backcountry, even within the national parks, where roads are limited to high-clearance vehicles, hikers, and mountain bikers. One of the best ways to experience the landscape is by river and there are numerous companies offering white water rafting and gentle river trips with plenty of opportunities to admire the scenery. We are looking for contributors for our Southern National Parks travel guide. If you are a local, a regular traveller to Southern National Parks or a travel professional with time to contribute and answer occasional forum questions, please contact us.